Something for any Hank Marvin and/or Shadows fans out there. Celebrating The Shadows is a concert of tribute acts to raise money for the Children In Need charity. The concert is on 20th of November in Rushey Way in Reading and includes four Shadows tribute bands. It also includes an auction for two electric guitars – a Fender 50’s Classic Stratocaster in Fiesta Red and a Burns Marquee in white. 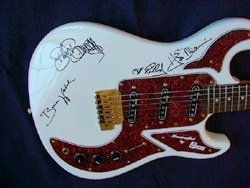 Each has been signed by Hank and the Shadows (Bruce Welch and Brian Bennet) as well as ‘Sir’ Cliff Richard. 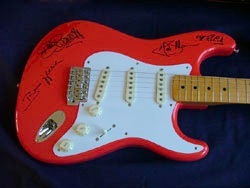 They’ll be auctioned off during the interval and all the proceeds will go to Children in need. Distance bids are accepted if you can’t get there in person. Phone Graham on +44 (0)118 375 8900 to register your interest. You can find out more at Celebrating The Shadows.